Works On iPhone 6 And WiFi Enabled. Turns Your iPhone Into An Advanced Covert Video Recording Studio! Walk Around Covert Video Will Never Be The Same Again! New LawMate Technology At It's Best! Remotely Control And View Or Download To Your Smartphone, Tablet, Computer Or Notebook. Watch live as the video evidence is happening! IP enabled lets you view from anywhere in the world! 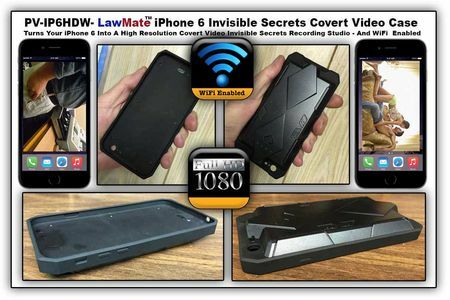 This new SmartPhone Camera from LawMate turns your smartphone into an invisible secrets covert video recording studio! Once attached to your iPhone 6, you can place it on covert mode and walk around recording all the covert video you need to capture quick and easy! It has simple one button design to boot-up and record shooting through an invisible pin-hole camera. The Camera features high resolution definition video resolution and 30 fps. Supports a MicroSD memory, 64GB SD card. This covert video revolution has time and date stamping and will record 16 minutes at 1920X1080 resolution (64GB SD card). On top of that, this new generation LawMate covert video recording studio is WiFi enabled which means you are obtain the video footage through WiFi while you leave the unit in place. Put LawMate covert video innovation in your covert video camera bag and you will always capture the all important covert video footage and legal evidence you need every time!